With the Oscars fast approaching, I wanted to repost my take on Hidden Figures, one of the films that has a real chance of winning the top spot. While it didn't sweep me off my feet like La La Land did, I loved this movie. Hidden Figures had the honor of shoving Rogue One off of the number one spot on its’ opening weekend. I suspect it’s doing so well because it’s such a good picture. 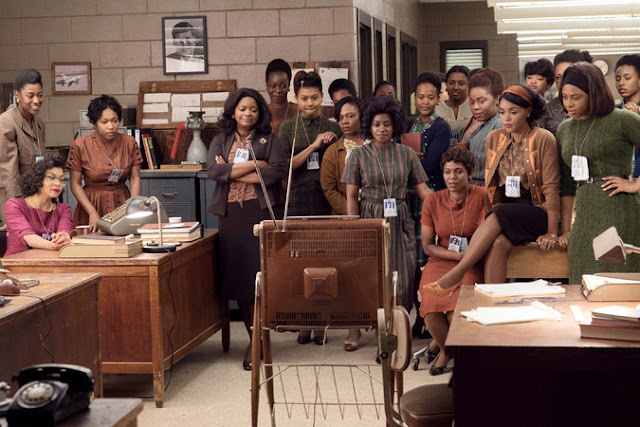 Based on the true story of three black women who worked at NASA in Virginia during the space war with Russia in the 1960’s, Hidden Figures stars Taraji P. Henson, Octavia Spencer and Janelle Monáe. When the NASA director Al Harrison (Kevin Costner) is frustrated that Russia is winning the space race he calls for a hunt to find someone who can do the more complicated math the mission needs. 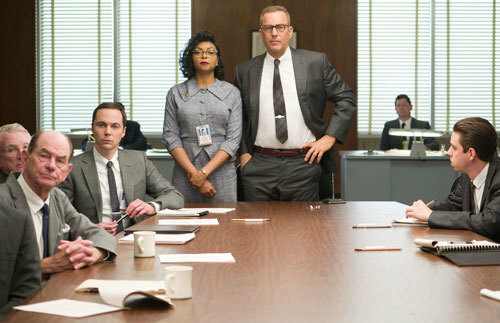 Enter Katherine Johnson, the pivotal role played by Taraji P. Henson. Johnson was a mathematical genius so advanced that she graduated from college at age 18. Johnson is one of the black women at NASA who do most of the mathematical calculations in the West Bldg, where the “colored’’ women work. Octavia Spencer is the supervisor—doing the work without the title or the extra money a supervisor is supposed to earn—who recommends Johnson for the mission. And it turns out Johnson is the only one who can do the critical math where all the white mathematicians, mostly men, have failed. It would be unbelievable except that it’s not, it’s all real. Getting recognition for her skills from her white colleagues isn’t easy in an era where segregation is still the order of the day. When schools and libraries, lunch counters, drinking fountains and bathrooms are still segregated. Luckily Harrison sees her worth. At NASA there is no “colored bathroom’’ in the building where Katherine now works so she has to run a half mile back to the “colored building’’ just to pee. When Costner, who, along with John Glenn, comes off as one of the few open-minded, non-racist people at NASA, barks because he’s frustrated at the length of Johnson’s breaks, Henson delivers one of the most powerful speeches in the film, an emotional and angry response to the racism she lives with on a daily basis. In response, Harrison goes on a tirade tearing down the racial barriers. Another powerful and moving moment. The film is at once both funny and moving, illuminating and inspiring, as Johnson and her two closest friends go on to break down color barriers in their respective areas of expertise. Octavia Spencer’s real life equivalent (Dorothy Vaughan) masters computer code and goes on to supervise not just a “colored’’ section in the computer department but an integrated group of both black and white women. Their friend and colleague Mary Jackson (Janelle Monae) is the first black woman not only to attend an all white school, but to achieve an advanced engineering degree. None of these achievements came overnight or easily. The cast includes Mahershala Ali as Johnson’s love interest, Jim Parsons and Kirsten Dunst take on the more thankless roles of whites not exactly eagerly embracing their black colleagues. Glen Powell portrays the handsome and heroic John Glenn. Here’s the trailer. Based on Margot Lee Shatterly’s biography of the same name, Hidden Figures is a must see. Amazon, YouTube, iTunes and Google Play Movies & TV.